#APDEECET 2019 Notification-Schedule-Online Application Form-Hall Tickets-Results-Rank Cards-Entrance Exam Date-How to Apply-Last for Apply Online: Office of the Commissioner of School Education, Andhra Pradesh is gong to release the AP DEECET 2019 notification in the month of April 2019 and DSE AP would invite the Online applications for category A seats (Convenor Quota) from candidates who intend to take admission into two years TTC or Diploma in Education (D.Ed) Course 2019-2020 in Govt DIETs/District Institutes of Educational Training and Private Elementary Teacher Training Institutions/AP D.Ed Colleges in the state to be conducted by Dept of School Education, Govt of A.P in Month of April 2019 in all 13 Districts of the state of A.P. Date and Timings of DEECET AP 2019 will be announced soon. DIET Entrance Test 2019 would be conducted from 10:30 A.M to 12:30 P.M (02 Hours). AP DEECET 2019 Notification-Schedule-Online Application Form-Hall Tickets-Results-Rank Cards-Entrance Exam Date-How to Apply-Last for Apply Online details time to time placed in this page. 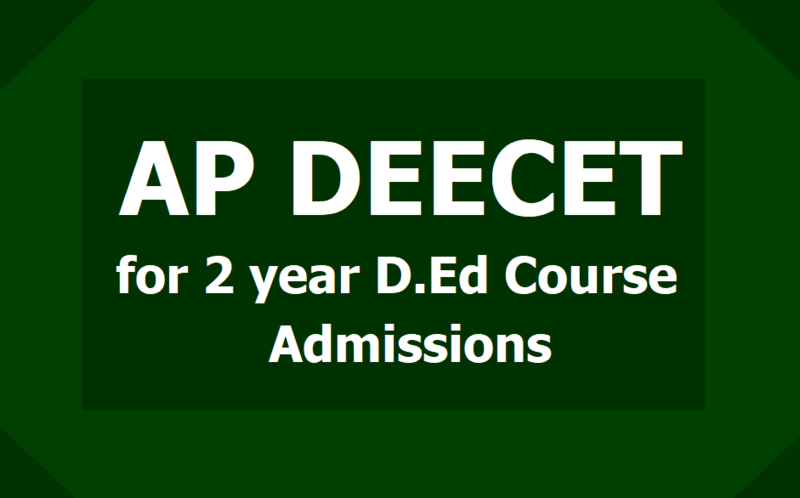 Here, AP DEECET admission Procedure and Rules GO.63,22 Details, Eligibility Criteria and Education qualification, Age limit, Qualifying marks, Syllabus Details, Exam Pattern, AP D.Ed Colleges List, NCTE new norms for D.Ed Course duration, AP DEECET 2019 Results, AP DEECET 2019 Rank Cards, AP DEECET 2019 Admissions, 1st, 2nd Phase Web Counselling Date/Schedule, How to fill Online Payment Form for Giving Web Options, How to give Web Options/ Web Based Selection of Colleges(User Guide), Provisional Admission Letter, Seat Allotment List and FEE Details, Certificate Verification Dates/ Schedule, List of Documents for Certificate Verification and Instructions, Fee Payment, Final Admission Letter details are provided here. #How many deecet seats are available in AP and Telangana states? I think in andhra pradesh state 20,000 seats and in telangana state nearly 14000 D.Ed seats are available. #APOSS/TOSS inter students are eligible or not for DEECET 2019: In this DEECET admission rules, there is no mention for aposs students. Many APOSS students have same doubt and also asked to me over phone and clarified that particular students. APOSS inter Candidates are Eligible for DEECET 2019, but they should have 50% marks in Inter for OC and BCs and 45% marks in inter for SC, ST and PHC Candidates as per Govt. Orders. #Qualifying marks in Entrance Test(DEECET AP) as per govt orders: Candidate belonging to “O.C” and “B.C” communities shall secure minimum 50% marks in DEECET. For Scheduled Caste, Scheduled Tribe and Physically Challenged candidates the minimum qualifying mark for allotment of seats reserved under the respective categories will be 45%.That is to say candidates belonging to SC and ST communities should secure 50% of marks for consideration against seats under OC / NCC / CAP / Sports category. Online Application Form Submission and Fee: The fee prescribed for appearing for DEECET (including examination fee ) is Rs 500/-( Rupees Five Hundred Only ) .Candidates can pay the fee through APONLINE/E-Seva centers or through payment Gateway as per the schedule and submit online application at the DEECET AP website https://apdeecet.apcfss.in/. Procedure for Online Application Form Submission: Detailed procedure for applying ONLINE is given in the Information Bulletin. Candidates can download the “Information Bulletin” free of cost from the DEECET website https://apdeecet.apcfss.in/ Candidates can submit their applications through online mode. DEECET shall be conducted in all the 13 Districts of the A.P state. Candidate can choose any District of his/her choice for examination center. However, when the capacity of any particular District gets exhausted that particular District will not be displayed in the list of examination centers given in the online application form. In such case the candidate has to choose another District of his/her choice from the remaining list available for examination centre. B. The candidate should satisfy Local / Non-Local Status requirement as laid down in the A.P. Educational Institutions (Regulation of admission) Order 1974 as subsequently amended. C. Candidate should have obtained a rank in DEECET-2019 and should satisfy the eligibility criteria prescribed. D. Age Limit: The candidates should have completed 17 years as on 01-09-2019 . There is no upper age limit. I. The candidate who passed or appeared for the 10 + 2 during 2016-17 final Examinations (Qualifying Examination) or its equivalent are eligible to appear for the entrance test . But, they should have passed the qualifying examination by the time of admission. II. The candidate should have secured 50 percent of marks in aggregate in qualifying examination for appearing in the DEECET both A & B category seats. The minimum percentage of marks in the case of Schedule caste, Scheduled Tribe and Physically Challenged candidates shall however be 45 percent for both A &B category seats. Note :The candidates who passed Intermediate with vocational courses are not eligible. III. Candidate belonging to “O.C” and “B.C” communities shall secure minimum 50% marks in DEECET. For Scheduled Caste, Scheduled Tribe and Physically Challenged candidates the minimum qualifying mark for allotment of seats reserved under the respective categories will be 45%.That is to say candidates belonging to SC and ST communities should secure 50% of marks for consideration against seats under OC / NCC / CAP / Sports category. #AP DEECET 2019 - How to Apply: Detailed procedure for applying online is given in the Information Bulletin. Candidates can download the ‘Information Bulletin’ free of cost from the DEECET website: https://apdeecet.apcfss.in/ and read it. After, Candidates can fill online applications through online mode only to take admission into two year Diploma in Education (Ded) in Government DIET colleges and Private DIET colleges in Andhra Pradesh and Telangana States. 1. The subject and syllabi of the test shall be of the standard of Classes VIII to X of A.P. State Syllabus for Part-II and Part III of the test. 2. The medium of Entrance Test: Question paper shall be in Telugu/English or Urdu/English and Tamil/English only. DEECET shall be conducted in all the Districts of the State. Candidate can choose any District of his choice for examination center. However, when the capacity of any particular District gets exhausted that particular District will not be displayed in the list of examination centers given in the online application form. In such case the candidate has to choose another District of his/her choice from the remaining list available for examination centre. All the sanctioned intake of seats in D.Ed course in the Govt. DIETs and Convenor quota (Category-A) private un aided Elementary Teacher Education Institutions shall be filled by the Convener DEECET-2019. Such seats shall be allotted to the candidates on the basis of the rank obtained in DEECET-2019. The intake capacity in each institute may change from time to time as decided by NCTE (National Council for Teacher Education). The admission procedure will be followed as per G.O.Ms.No.63, EDUCATION (PE-PROGS.II) DEPARTMENT dated:28-10-2013. The details pertaining to the Structure and content of the test, Syllabus, Pass Criteria, Rule of Reservation and allotment of seat are given in the DEECET 2019 Information Bulletin will be released soon by the DSE officials. Every candidate should read the deecet guidelines carefully for know more information. sir.is there 8th and 9th syllabus for deecet 2016....or....10th and intermediate only..
60 marks Part A 10th Standard lo questions and 40 Marks Part B Inter Standard lo question vasthayee..